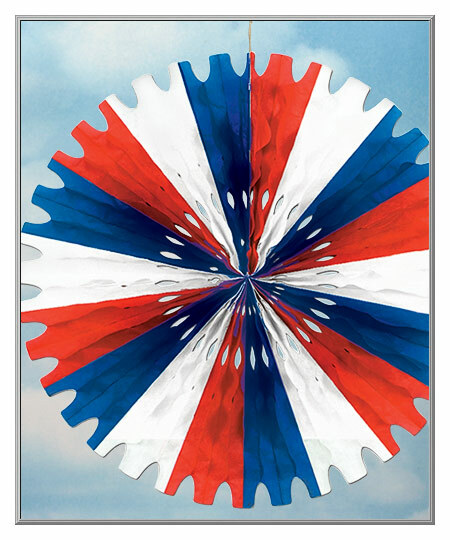 25 " wide ~ Made in the U.S.A.
An old-time favorite, this tricolor tissue rosette fan is a festive way to display the red, white and blue! Made with a loop for hanging, the top-quality art tissue rosette is still manufactured in the U.S.A. by a party goods firm that was founded back in 1900. The tissue rosette arrives flat and opens into a double-sided decoration. Sold as one tissue rosette. into a decoration that is 25" wide. 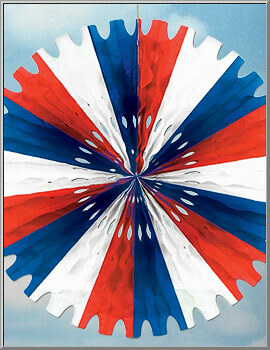 Patriotic Tissue Rosette ~ 25"